The ideas behind most hidden object games are fairly cliche by now, with the majority either focusing on spooky mansions where apparitions talk to you, or in victorian era villages where steampunk and high society are the main themes. 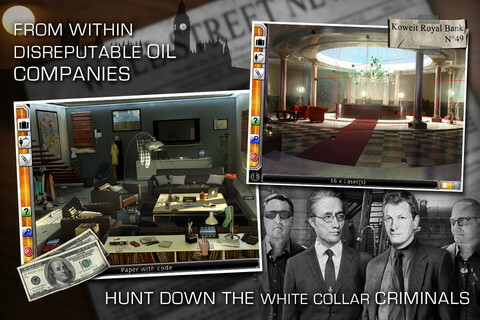 Criminal Investigation Agents: Petrodollar$ ($2.99) does things a bit differently, and isn’t a great game, but is so fun to laugh at while playing it’s worth checking out. 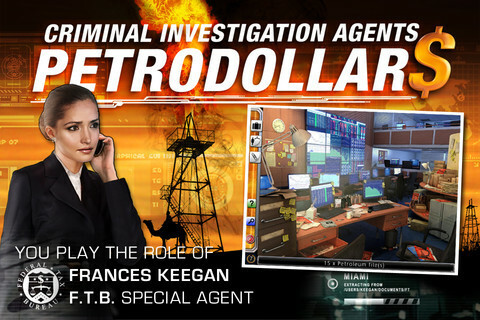 In Petrodollar$, you play as Frances Keegan, an agent for the Federal Tax Bureau that needs to investigate a conspiracy surrounding an oil company’s finances. That’d usually be enough to set off the crazy alarm, yet there’s more. Keegan’s coworker has disappeared, and she believes that someone in big oil had something to do with it. It’s basically every cheesy TV movie you’ve ever seen rolled into one. Playing the game isn’t that much different than many other hidden object games. 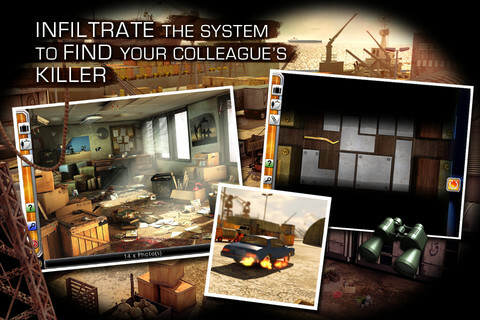 You’re given a few clues as to what to look for in a given scene, and you just tap to collect the items once found. Apparently that just wasn’t enough here though, as there’s a tilt gimmick that works sporadically. Trying to tap the screen while turning your iPad sideways doesn’t seem to work too well, and it’s baffling to understand the mindset behind that move. The story in Petrodollar$ gets even more ridiculous the more you explore, and the scenes that have you finding things certainly don’t help. Everyone involved in the story is a total slob, leaving clothes and other items strewn throughout the room without any rhyme or reason. Their working environments don’t appear to be much better either, as “Top Secret" files are often just left out in the open, which leaves much open to the prying eyes of Keegan. Confusing dialog compounds the situation with bad english at every corner. The errors just keep coming though, and make absolutely no sense as soon as you come across timed puzzles to play. The instructions read something like “You have 2 minutes to complete the puzzle" when you actually have 6 minutes, for instance. A particularly weird scene that describes the game perfectly comes when Keegan is tracking a suspect to London. The suspect arrives in London, and Keegan is able to track him down using a GPS bug on his phone. Apparently the guy didn’t have much to do in London, because he’s expected to be in this same place the entire time Keegan is traveling there from the US. Not only that, he doesn’t wake up when you break in and enter his hotel room, turn on the lights and ruffle through his stuff. At one point during this excursion, you have to figure out a sequence of letters to form a key clue phrase in the mystery. The phrase ends up being “Copy Data" and Keegan acts as if it’s some huge revelation that’s the turning point in the whole story. Watching this mess play out had me almost in tears laughing at the ridiculous nature of it all. In summation, Criminal Investigation Agents: Petrodollar$ isn’t a very good game when it comes to actually playing it or taking it seriously. However, with the right mindset going in, you could definitely have fun listening to just how ridiculous the story is, especially when taking into account all of the ludicrous tasks that go along with it. 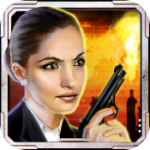 Step into the shoes of female investigator Keegan and bring down the people that think they're above the law.